The Eloquent Woman: Famous Speech Friday: Sandra Day O'Connor on "Portia's Progress"
Famous Speech Friday: Sandra Day O'Connor on "Portia's Progress"
Sandra Day O'Connor, the first woman Associate Justice of the U.S. Supreme Court, couldn't find work at a national law firm after her graduation. She finished third out of her class of 102 students at Stanford Law, but the closest she came to a job offer was the position of legal secretary. That kind of rejection wasn't likely to deter a woman who kept a pet bobcat as a child. Raised on the Lazy B cattle ranch in Arizona and often left to fend for herself, O'Connor grew up resourceful and focused on getting the job done--whatever the job might be. She worked as a public attorney in California and Arizona, took five years off to raise her children and finally sat on the Arizona Court of Appeals before President Ronald Reagan named her to the nation's high court in 1981. O'Connor handled the intense press surrounding her appointment with humor, while never downplaying the historical significance of her new job. When the New York Times carelessly referred to the "nine men of SCOTUS" (the Supreme Court Of The United States) in a 1983 editorial, she wrote a playful rebuke signed by "FWOTSC" (the First Woman Of The Supreme Court). 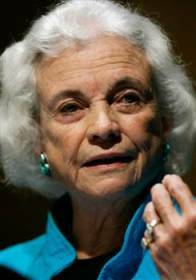 Like most Supreme Court Justices, O'Connor soon became a frequent public speaker. Some of her earliest speaking lessons came at the El Paso, Texas, Radford School for Girls, where one of her elementary teachers, Miss Fireovid, made her recite poetry, read aloud and give speeches before the class to help her overcome her shyness. "It is something that probably helped me the rest of my life," O'Connor said. Her most-quoted speech is "Portia's Progress," delivered at the New York University Law School in 1991 on the 100th anniversary of the school's admission of women. The occasion and the topic--focused on the history and prospects of women in the law--was a natural for O'Connor. What can you learn from this famous speech? Don't be afraid to be contrary. Ten years after her appointment to the Supreme Court, O'Connor had learned confound expectations. The speech skewers the myth of the "True Woman"--unsuited for argument, best kept at home and out of the public fray--that barred women from the law for hundreds of years. But O'Connor also disappointed many women with this speech by rejecting what she called a "new feminism," which suggested women had different (and perhaps more useful) aptitude and style than men when it came to the law. Take advantage of speaking opportunities when you're the ultimate insider. Who better to give a speech about the progress of women in the law than the first woman to reach the pinnacle of the profession? O'Connor shares her personal experiences behind most of the topics in this talk, from her rejection by private firms to the difficulties of blending work and family. She also gave the audience an insider's perspective on how and why the Court ruled on the latest cases regarding women in the workplace. Use quotes that say it all. Like most lawyers, O'Connor layered her talk with case names and decision minutiae that can make a non-legal mind wander. But the talk remains lively with her choice to include colorful, often stinging quotes from the people involved. My favorite comes from Clara Shortridge Foltz, the first woman lawyer in California. When an opposing attorney suggested Foltz should be at home raising children, Foltz replied, "A woman had better be in almost any business than raising such men as you."